Fine & Rare, the limited-edition Alec Bradley cigar rolled with 10 different tobaccos, is headed back to stores this month. Since 2011, the company has released small quantities of its most complicated cigar blend, rolled in different shapes with Honduran and Nicaraguan tobaccos from various regions and crop years. This year, Fine & Rare returns to cigar shops in a form called JRS10 = (86), a size that first appeared in 2015 and scored 89 points. The cigar is priced at $21.90 and ships in eye-catching boxes that hold 10 cigars and are designed to look like zebra wood. Only 2,500 boxes will be released on October 24. 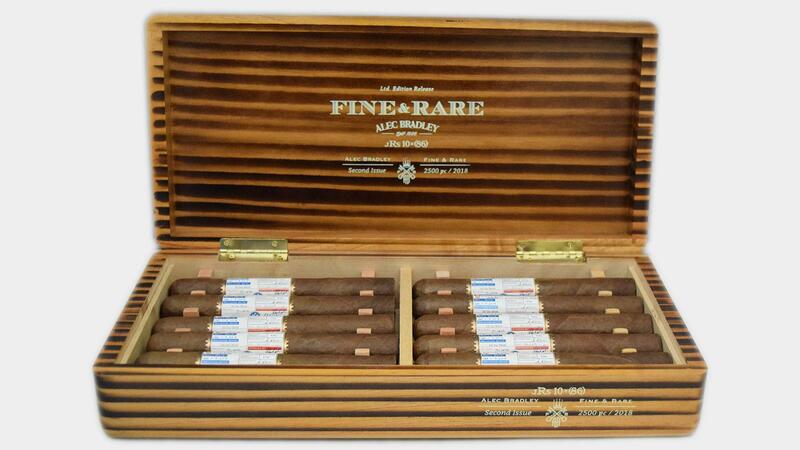 Alec Bradley Fine & Rare is rolled at the Raices Cubanas Factory in Danlí, Honduras.